While walking around and enjoying the holiday lights in downtown Salt Lake City, be sure to stop by the Macy’s candy windows at City Creek Center. Macy’s invited visual merchandising students from the Salt Lake Community College Fashion Institute to participate in the holiday window display. “Through our partnership with Macy’s we were invited to get involved and create one of the globes,” says Fashion Institute program director Mojdeh Sakaki. This invitation has been extended for the last four years. Under the guide of adjunct professor Matt Monson, 14 students and Monson’s daughter created the globe. Macy’s is celebrating the 50th anniversary of “A Charlie Brown Christmas” by designing their candy windows with characters from Charles Schulz’s iconic comic strip. According to Sakaki, students are informed of the theme about two months prior to the event. Students then create multiple designs and submit their work to Macy’s merchandising crew. After all the designs have been presented, the merchandising crew approves the design that best fits and exhibits the theme. Sakaki says the students spend a month working on their globe. 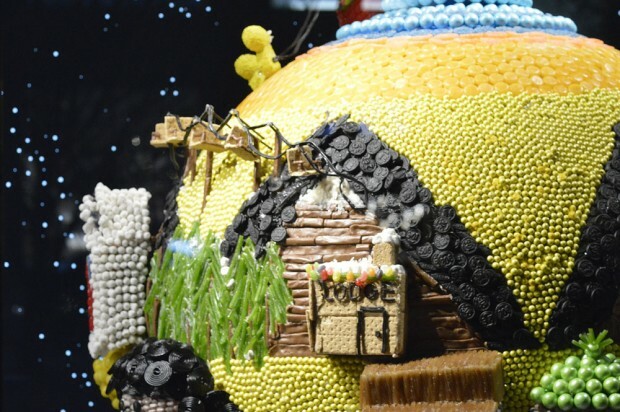 Thousands of pieces of candy — weighing more than 40 pounds — are used to form the Peanuts characters, Snoopy on top of his decorated dog house, the town and brick wall. “Every year we look forward to it and treasure our partnership with Macy’s,” Sakaki says. Sakaki says that other holiday decorations that were made by fashion students are also featured at the City Creek store. The decorations will be on display through the holiday season. 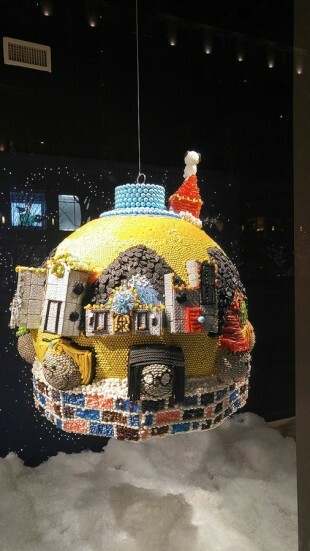 Thousands of pieces of candy were used to build the design of SLCC’s candy globe, on display at Macy’s in City Creek. Charlie Brown, Lucy and other characters adorn the candy globe crafted by SLCC visual merchandising students. 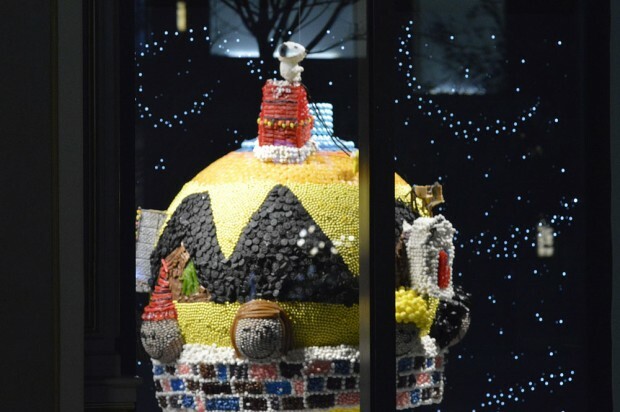 Snoopy sits on top of his red house at the very top of the SLCC candy globe at Macy’s in City Creek Center.